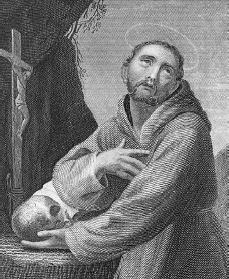 The Italian religious leader St. Francis of Assisi founded the religious order known as the Franciscans. He became renowned for his love, simplicity, and practice of poverty. Francis was born Giovanni di Bernardore, but because his father called him Francis, so did everyone else. He was baptized shortly after his birth in the town of Assisi in central Italy in 1182. His father, Pietro di Bernardone, was a successful cloth merchant, and Francis grew up with a love of fine clothes and good times. He led the other young men of the town in enjoying good food and drink, singing, and dancing. He was educated in math, poetry, and music and learned to read and write while attending a school that was part of the Church of Saint Giorgio of Assisi. Francis was expected to become a cloth merchant like his father and did not plan to attend college. Francis joined the forces from Assisi in their fight against Perugia, another town in Italy. When he was twenty, he was taken prisoner. A year later, sobered by jail and sickness, he underwent several religious experiences in quick succession. In one of these, while he was praying in the run-down chapel of Saint Damiano outside Assisi, he heard a voice from the crucifix telling him, "Francis, go repair my house, which is falling in ruins." Francis went quickly back to the city, sold his horse and some cloth from his father's shop, and came back to give the money to the priest at Saint Damiano. Francis's father, furious that his son wasted his money on churches and beggars, took him before the bishop to bring him to his senses. When the hearing began, Francis calmly took off all of his clothes, gave them to his father (the astonished bishop quickly covered Francis with a cloak), and said that he was now recognizing only his Father in heaven, not his father on earth. He lived his life from this time on without money and without family ties. The thirteenth century was a time of troubadours, or poet-musicians, and Francis had the best of their characteristics. He was happy, he sang, he loved nature; he spoke to the birds and the animals as though they were his friends. In his "Canticle of Creatures," also called "Canticle of the Sun" (a canticle is a religious song), he wrote about Brother Sun and Sister Moon. Once he was heard to beg pardon of his own body for its sins. Francis referred to his way of life as his marriage to Lady Poverty. The thirteenth century was also a time when the Christian religion was taken very much for granted, and Francis felt the need to return to the original spirit of Christ. This meant living without materialistic attachments, and it also meant loving other people. A number of the young men of Assisi, attracted by Francis's example, joined him in his new way of life. In 1209 Francis and his companions went to Rome, Italy, where they presented their ideas to Pope Innocent III (c. 1160–c. 1216; the pope is the head of the Catholic Church) and received his approval. They found themselves influencing more and more people, including a lady named Clare, whom Francis helped to enter a monastery of nuns and who later began the "second order" of Franciscans, the order for women. In 1212 Francis left for the Holy Land, or Palestine (the land in the Middle East where Christ had lived). His ship ran into bad weather, and he had to return to Italy. Two years later his adventurous spirit and missionary zeal drove him to seek the Moors, who were Muslim, in Spain, but sickness prevented him from completing the trip. He tried once more, in 1219, going to Egypt with the Crusaders (religious warriors who attempted to take control of the Holy Land). At the siege of the city of Damietta in Egypt, Francis boldly walked through the battle lines into the enemy camp and met the king of Egypt, who, apparently impressed with Francis's ideas about brotherly love, gave him permission to continue on to the Holy Land. When Francis heard that trouble had started in Italy among some of his followers, now numbering in the thousands, he returned home. The force of his own personality had held the group together, but now Francis saw the need for a more practical guide to his kind of Christian life. He insisted that the new rule stress the poverty he felt was so important: the order could not possess money; all its houses must be simply furnished; and each Franciscan could have only a tunic and cord (Francis himself wore an old sack tied at the waist), a pair of pants, and, if really necessary, a pair of shoes. Francis went to Rome in 1223 to present the new rule to Pope Honorius III, who approved it wholeheartedly. It was during this visit that, according to tradition, Francis met Dominic, who had founded his own religious order. The Franciscan and Dominican religious orders have always felt a close relationship that dates back to the friendship between their founders. Francis returned to Assisi and began to spend more and more time alone in prayer, leaving the decisions about his organization to others. While he was praying on Mt. Alvernia in 1224, he had a vision of a figure that looked like an angel, and when the vision disappeared Francis felt the wounds of the crucified Christ in his hands, side, and feet. He was careful not to show them, but several close friends reported after his death that Francis had suffered in his body as Christ had suffered on the cross. His last two years were lived in almost constant pain and near-blindness. He died in 1226. Two years later he was made a saint. Homan, Helen. Francis and Clare, Saints of Assisi. New York: Farrar, Straus & Cudahy, 1956. House, Adrian. Francis of Assisi. New York: HiddenSpring, 2001. Martin, Valerie. Salvation: Scenes From the Life of Saint Francis. New York: Knopf, 2001.